6/16 Cup of Coffee: It was a split night for the affiliates as the top half of the system saw their pitching struggle, while Greenville and both DSL teams found the winner's circle thanks to solid performances on the mound. Salem was idle, as its contest against Potomac was washed out. In a game that featured 28 hits, the Indians late-inning offensive burst was enough to push them past the PawSox. Sean O'Sullivan started for Pawtucket, allowing five runs on ten hits and two walks in four innings. Kyle Martin, who followed O'Sullivan, took the loss, allowing three runs on three hits in 2 1/3 innings. Pawtucket jumped out to a quick 3-0 lead in the first, plating runs on singles from Chris Marrero and Henry Ramos as well as a throwing error. After the Indians scored five runs across the first and second innings, the PawSox brought home a run in the third (a Bryce Brentz RBI single) and the fourth (an Ali Solis sacrifice fly) to tie the game. Brentz laced a solo home run in the seven to give the PawSox a brief 6-5 advantage. The lead didn't last long as Indianapolis plated three in the bottom of the seventh and two in the eighth to put the game out of reach. The top of the PawSox order did most of the offensive damage, with the 1-4 hitters combining to go 9 for 16 with a home run and three RBI. Kevin McAvoy was roughed up for six runs on eight hits and two walks in just 2 2/3 innings as the Sea Dogs fell to the Baysox. Taylor Grover pitched well in relief, allowing just three hits and a walk in 3 1/3 innings. Jake Drehoff finished the last two innings, allowing a run on two hits. Down, 6-0, in the fifth, the recently signed Cody Decker (in his first game as a member of the Red Sox organization) led off the inning with a solo home run, and Tzu-Wei Lin added an RBI single to put the Sea Dogs on the board. The loss dropped Portland to 22-42 on the season. Strong pitching and early offense helped Greenville win its fourth in a row. Logan Boyd (pictured, above right) was superb as he improved to 7-3. The left-hander allowed just one run on four hits, punching out five in seven innings of work. In his first appearance of 2016, Trevor Kelley pitched a scoreless inning of relief, striking out two. Anyelo Leclerc snagged his seventh save, pitching a scoreless ninth inning. In the bottom of the first, the Drive brought home three runs on an error, a Tate Matheny ground out, and a Luis Alexander Basabe single. Basabe would add an RBI ground out in the third, giving Greenville a 4-0 lead. Michael Chavis was 2 for 4 with a run scored; it was his third multi-hit game in the seven games since his return from the disabled list. The finale of the Red Sox series against the Nationals was cancelled due to rain. Since the two teams do not meet again during the first half of the season, the game will not be made up. A late game offensive burst propelled the Red Sox past the Marlins. Alejandro Rodriguez received the start, allowing a run on three hits and three walks while striking out five in four innings. Oddanier Mosqueda picked up his first professional victory, hurling three innings of relief and allowing one run on a hit and a walk. The stars of the game offensively were leadoff man Kervin Suarez, who was 2 for 5 with a pair of doubles and three RBI, and Ramfis Berroa, who was 2 for 5 with a double, home run, and three RBI. Red Sox pitching struck out 11 batters as they blanked the Astros. 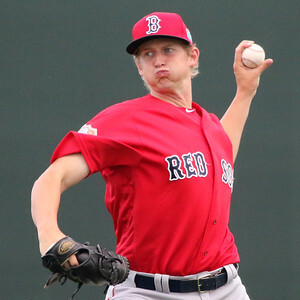 Jose Gonzalez received the start for the Red Sox, allowing just three hits and four walks while striking out five in four innings. Ryan Oduber picked up the victory, allowing three hits and a walk while punching out six. Victor Familia picked up his first professional save, tossing a scoreless ninth inning. Everlouis Lozada and Pedro Castellanos both had multi-hit games in the victory. Player of the Night: Logan Boyd gets the honor after submitting the longest outing of his season. He went seven innings against Hickory and improved to 7-3. The 22-year-old left-hander threw 55 of his 90 pitches for strikes, allowing just one run on four hits while striking out five.